Step into Adventure Land and find yourself inside the giant pinball table that is Spinball Whizzer, surrounded by giant pinballs and bumpers scattered throughout the area; even the floor is complete with score pads! Don't fancy pinball? Why not take on your friends and family in a larger than life game of Foot Darts opposite the area's entrance instead. 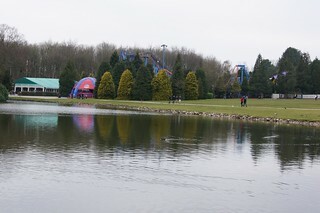 Adventure Land is also home to the park's Hospitality Suite, which hosts a range of private hire, events and family fun days throughout the season near the main lake at the entrance to the area. The area Adventure Land currently occupies was first developed in 1986 under the name of Kiddies Kingdom. The area was essentially a giant playground, with various climbing structures and children's play equipment. Over the years, many of these facilities came and went and 1992 saw the relocation of the Big Top to sit alongside Kiddies Kingdom, bringing the park's ice shows to the area. In 1997 The Beastie and The Gallopers carousel both moved to Adventure Land, with the rides replacing much of the original play equipment. The remaining equipment was replaced in 2002 when the area became New Adventure Land, with three new play areas arriving, including Space Adventures. New Adventure Land however was short lived as 2003 saw the other two play areas removed and The Gallopers moved back to Cred Street, in preparation for the 2004 project. The arrival of Spinball Whizzer in 2004 dramatically changed the look of Adventure Land and broadened the audience it appealls to. The construction of the new coaster also brought with it the distinctive structures that housed its on-ride photo unit and the [email protected] food outlet (later Spinball Noodles). In 2010, the arrival of Sonic the Hedgehog saw Spinball Whizzer transformed into Sonic Spinball and repainted into much darker colours. That season would also be the last for the Beastie and for several seasons after the classic children's coaster sat behind a wall waiting for removal. Spinball Noodles also closed in 2012. More recently the area which once formed the exit from Adventure Land to Storybook Land was carved out of the area to become part of CBeebies Land. 2015 saw the areas lineup further reduced as Space Adventures was removed to make way for the Octonauts Rollercoaster Adventure in CBeebies Land. 2016 saw Sonic spin back out of the park, with the coaster once again becoming Spiball Whizzer. Between these developments and the Long Term Development Plan earmarking Spinball Whizzer for removal from the park, it is clear that Adventure Land is one area of the park that is ripe for redevelopment over the next few seasons.